And it happened. Torn unrestrained desire to acquire additional cash I decided to act. And so, listening to the known saying, “To win you have to play” I decided to try my hand at the lotto. What was my surprise when checking the coupon it turned out that I won 42 zł (well, actually 39, 50, because the intact would not subtract the purchase price, which cost me 2, 50). I quickly wanted to know what I was lucky. I searched a bit on the internet and found that the probability of my winning was 1:175. Well, I don’t hide that the possibility of winning was quite small. Of course, you need to know from what perspective to look. For example, to hit “Six” where the probability of winning is 1 to 13983816, my winnings may seem simple. Despite the temptation I decided not to bet my winnings. After a month, during the winter holidays I also bought several bets, but I lost 12 zlotys. Well, apparently Fortuna has left me. I stopped playing. But I have always liked to look at the behavior of the human race. How do others strive to win? How skreślają the number? People who play occasionally often put on numbers with whom they usually have something to do. namely their date of birth, whether the date the birth of their loved ones. Often zakreślają your favorite numbers or maybe happy numbers. And here, let me have a small digression. Never, I will never understand the phenomenon of lucky numbers. 7, 8, or maybe 21? What’s the difference? For example, according to Feng Shui is considered a very happy number 8. This figure allegedly has herald abundance, wealth and growth. All in all it was nice because I was born eighth. An interesting number is also nine. In Chinese sounds like longevity. And here another pleasant surprise. My year of birth abounds in two nines. The bad, unlucky number is supposed to be a foursome, because in Chinese sounds like death. People often also cite the so-called warm and cold numbers. Warm is those that in the last accumulation were very often wylosowywane, while the cold are the opposite of warm, that is, a long time has not been drawn. You are more desperate to also seek support in the stars, but I will not dwell on them. A significant group of people play using alleged systems. And here, corrected one important thing. Despite this, the Internet is not difficult to find pages with “Stuprocentowymi” systems. Of course, hardly anyone knows to let us know that these only work in theory, that is, assuming that we have infinite financial means to play. (That is, actually, you might as well circle the numbers accidentally.) Well, but what after some apparently like to hinder the life of wikłając in the very confusing principles of “systems”. Another thing is the systems served by the same sportowy. They do not rely on the matchmaking of different numbers or grouping them in a very strange way. 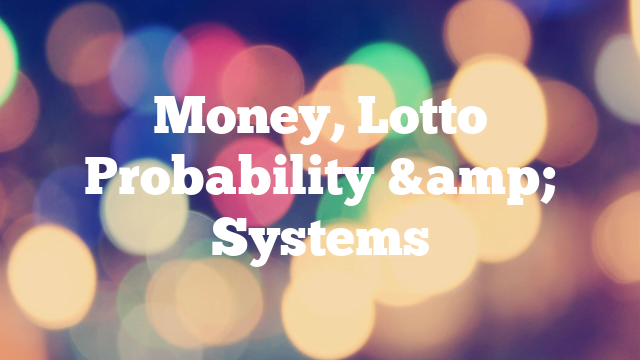 The official systems of the Lotto games simply rely on the possibility of deleting more numbers. And so, instead of the six numbers, you can delete up to 12 which is not a bad idea, because the probability of hitting a six is then 1:15134. Looks great? Not exactly, because the coupon you have to pay more than 2000 zł. Therefore, such a play is good when a group of people consists of a coupon, and then in the case of winning shares a winning cash.